You call around Sparta, NJ, for estimates, you call the Professional, Insured, registered companies and the estimate, YOU think the price is way too high. Then you find a guy that works by himself or has a worker and gives you a price for window cleaning service for half or less than the original estimate you received from the reputable, insured and professional window cleaning company. You decide to go with the small uninsured company to power wash your home to save a few dollars. This small company is bragging about his experience and shorts out one of your GFI receptacles outside. This intern blows out your breaker box, causing your refrigerator to go out, causing food spoilage which ends up costing thousands of dollars between the electrician and replacing all the food, not to mention the clean-up costs. You call the small CHEAP window cleaning service guy, and let him know what happened and guess what??? No insurance, if he/she even returns your call….. This comes out of your pocket!!! Sure, you can bring him to small claims court but you know the old saying … “You can’t get blood from a stone”. And one more thing, your standard homeowner’s insurance or landlord liability insurance most likely will not cover you for these events. Most of these policies exempt damage caused by the use of illegal, unlicensed and or uninsured contractors. One way to protect yourself form this is to simply ask for an insurance certificate before ANY for window cleaning service work in started. If the contractor cannot provide you with one or makes up an excuse why he/she cannot get you one, then run… Run as fast as you can!!! What if the contractor you hired had an employee on the job at your home or business who was injured on your property but the contractor didn’t carry worker’s compensation insurance? That employee could sue you, the homeowner. Your homeowner’s policy MIGHT help cover the cost to pay that worker’s claim, after you meet your deductible, but the claim could result in an increase in your rates and make it more difficult for you to get insured in the future. My advice to you, to save yourself the stress and risks involved with hiring CHEAP, unqualified and uninsured contractors. Hire a company who you KNOW has earned the credentials of their trade and follows good business practices. You’ll have a much better chance of seeing your job done right the first time. It might be appealing when comparing the estimates of an uninsured, unlicensed and non-bonded contractor to one who has those credentials. Insured, bonded and licensed contractors usually charge more than those who haven’t earned the credentials or paid for the insurance protection. I like to look at it this way: If a contractor doesn’t follow the law (or good business practices) in being insured, licensed, bonded and paying taxes, what else is he/she cutting corners on?????? If something goes wrong, it’s YOU who will be paying the price!!!! Failing to hire an insured, licensed and street legal contractor could potentially cost you everything you own. If the worse happens, you could be sued by the very contractor you hired and forced into bankruptcy, and most state laws only allow you to keep a very limited amount of wealth or property once you declare bankruptcy. All this to save a few dollars! 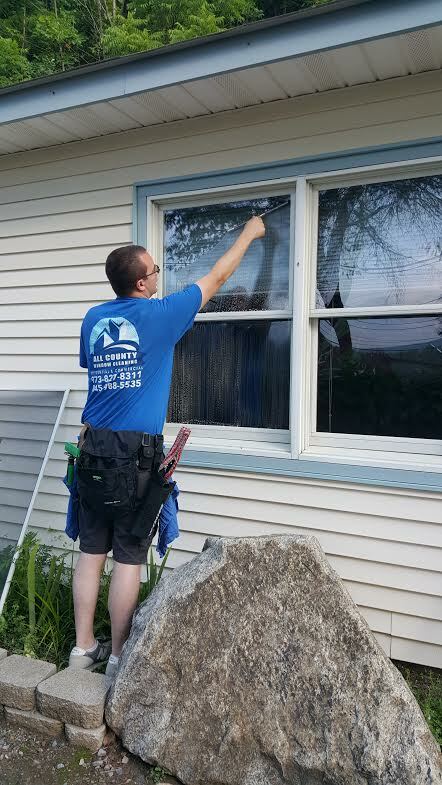 Isn’t hiring the right window cleaning service contractor worth your peace of mind?